For those not familiar with the U.S. Commemorative program the 1991-1995 World War II Half Dollar is tad confusing as it was minted in 1993 but the date of issue appears nowhere on the coin. The date range of 1991-1995 is actually a 50 year anniversary of World War II from 1941-1945 and not the year or years of mintage. Additionally, it was one of three coins issued, which also included a silver dollar and $5 gold coin. 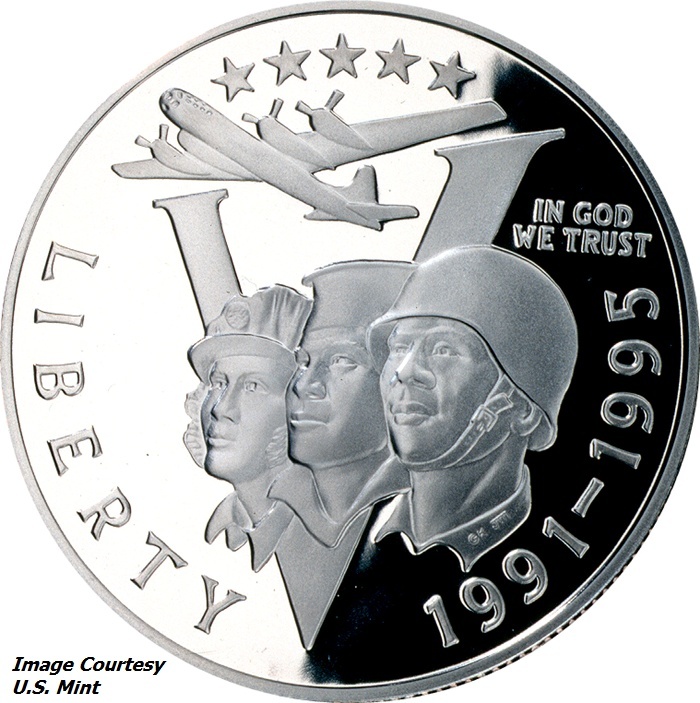 The obverse was designed by George Klauba and features the faces of three United States service personnel superimposed upon the "V" for Victory symbol as well as a WWII Bomber flying above with five stars. To the right of the design is the phrase “IN GOD WE TRUST”. On the outer periphery is the word “LIBERTY” and date “1991-1995”. Located on the collar of the soldier are the designer's initials “GK”. 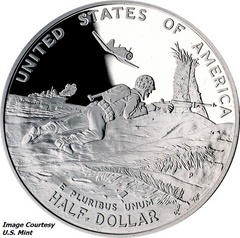 The reverse was designed by Bill J. Leftwich and features a Pacific island battle scene. On the outer periphery are the words “UNITED STATES OF AMERICA”, “HALF DOLLAR”, and “E PLURIBUS UNUM”. In the lower right of the design are the mint mark “P” for Philadelphia and the designer's initials “BL” and engraver's initials “TJF”. On anticipation of being a poular coin, the U.S. Mint authorized the mintage of 2,000,000 coins but due to low demand that figure was not even close to what was realized. Popularity for the coin did not increase until years later driving the prices in the secondary markets higher but nothing astronomical.